Whole cottonseed as a supplemental food for deer is great choice for maintaining the physical health of a deer herd. It is especially effective for improving the body condition of bucks following the rut. Because cottonseed is high in protein and fat it allows post-rut bucks to put weight back on rapidly, meaning more energy is reserved for antler growth which is just a few months down the road. Feeding cottonseed will increase deer body condition, help improve annual fawn production and allow for increased antler development in bucks, but as a feed it should not be considered a complete ration for whitetail deer. 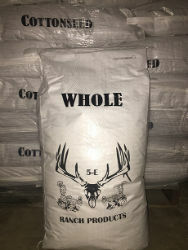 It’s not a one-stop-shop, but whole cottonseed is a great supplement for whitetail. High quality cottonseed that is sacked in a convenient, easy to carry and open 40 lb bag.